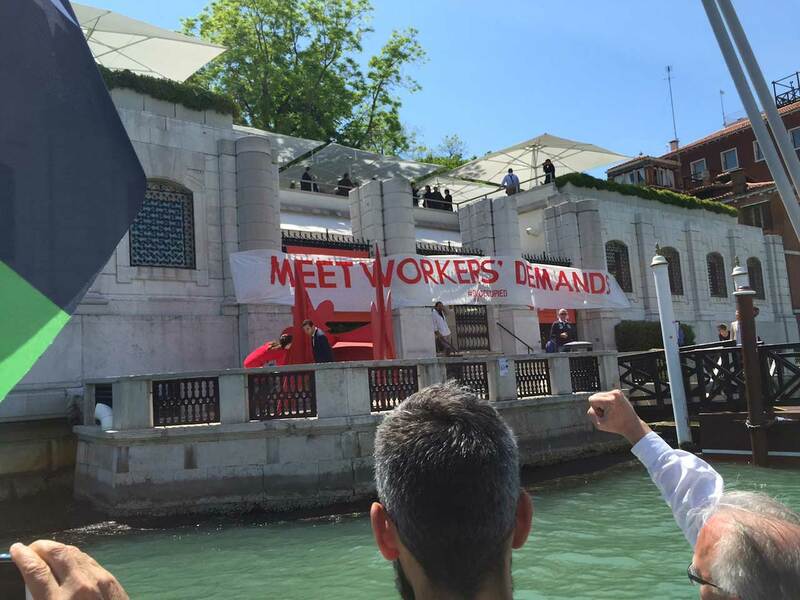 The Guggenheim’s Abu Dhabi project is just the latest cultural institution in the Persian Gulf to be targeted by this coalition of workers, academics, and artists. The wealthy nations of the Persian Gulf have been taking heat recently for not taking in more humanitarian migrants from neighboring war-torn countries in the Middle East, but these insular petrostates are actually packed with refugees of a different sort. The countries regularly import masses of migrants from Bangladesh, Nepal, and other Asian countries to construct the revered cultural institutions—such as university campuses, ritzy galleries, and sporting arenas—that dot the Gulf’s manicured paradisical landscape. While these workers, toiling under exploitative, often abusive conditions, make up the underbelly of globalization, there’s more than brute labor happening on these neoliberal fiefdoms. Globalization is galvanizing an international cultural movement to bring labor rights to the foreground of the art world. 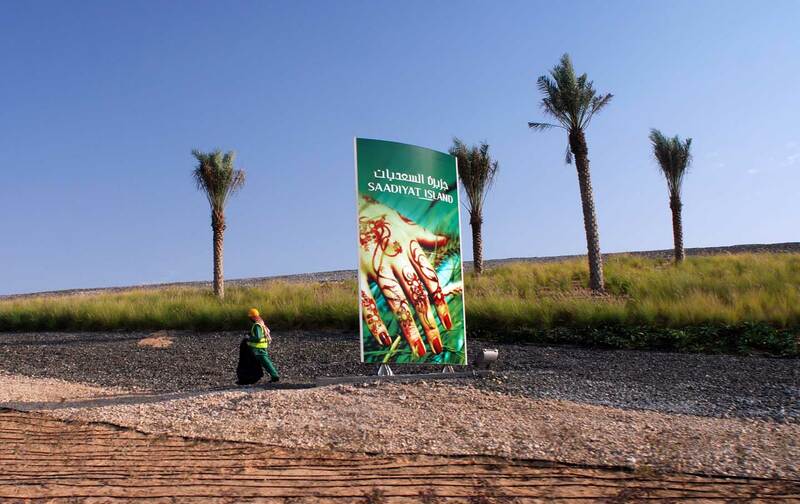 The Gulf Labor movement began when academics and activists started campaigning to raise awareness about labor conditions at Gulf development projects linked to Western institutions, particularly New York University’s state-of-the-art satellite campus on Saadiyat Island in United Arab Emirates (UAE). Taking a page from the protest playbook of the anti-sweatshop movement generation, they used the campus as a site of community education and protest. 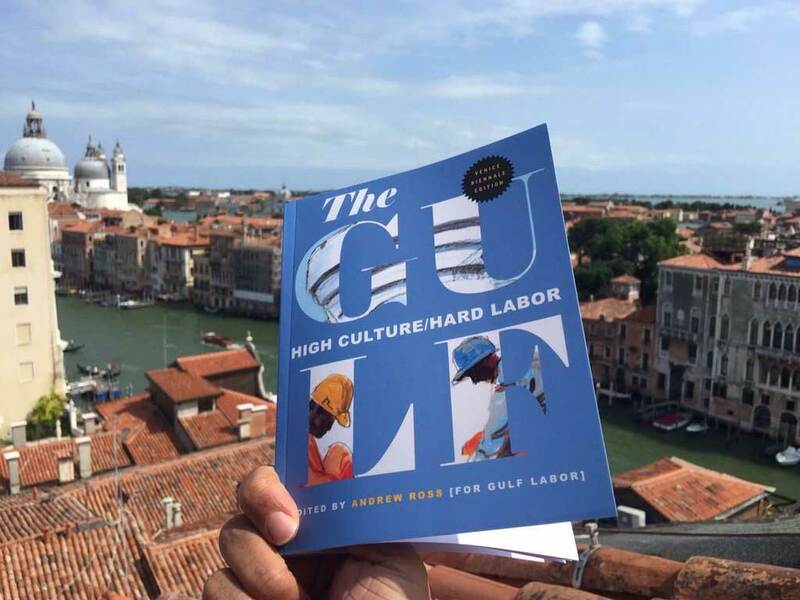 Over five years, Gulf Labor and its activist network have evolved into a community-labor-arts alliance that challenges growing entanglements between cultural and academic industries and corporate and authoritarian regimes. The group’s new book, Hard Labor/High Culture, documents a half-decade of progress through a compendium of critical essays that draw on academia and agitprop. It’s not a manual so much as a scrapbook showing an ever-widening “diversity of tactics” including boycotts, field research, and spectacular protests, banner drops and strikes, from Manhattan’s Upper East Side to Uttar Pradesh. Throughout this time they’ve dialogued with boards of trustees, unions organizing in the Middle East, and human-rights groups—while still making time for a guerrilla intervention featuring the Handala icon of the Palestinian resistance at the Venice Biennale. In the end it is uprisings by workers and revolts by cultural activists that will fuel social change in the Gulf. Both the UAE government and the institutions have bristled at such demands. Though NYU and Guggenheim have established labor codes of conduct, enforcement remains sporadic, according to various audits detailing systematic wage theft and ongoing failures to compensate abused workers. The UAE government has reportedly thwarted and interfered with efforts by Gulf Labor activists, including Ross, to conduct independent field research on local working conditions. In late September UAE ministers appeared to yield to public pressure, at least on paper, by announcing key reforms, including granting workers the ability to change employers at will, barring employers from changing contracts unilaterally after they are finalized, and loosening the restrictions of the coercive kafala system. But Human Rights Watch has questioned how serious the UAE will be about implementing the changes. It’s unclear whether there will be fundamental restructuring of the kafala system, which has long governed indentured migrant labor contracts. Moreover, UAE partnerships with NYU, the Louvre, and Guggenheim have been denounced for failing to uphold international labor standards, let alone those organizations’ own, purportedly more extensive, codes of labor conduct, regardless of UAE’s legal reforms. And since the new rules are set up to be enforced largely through complaints, impoverished South Asian workers might simply lack the legal and social means to formally complain, particularly since labor organizing and all forms of civic activity remain strictly curtailed. In the end it is uprisings by workers and revolts by cultural activists around the world, not fines or negotiations, that will fuel social change in the Gulf. The nexus of art and labor activism is not merely about sympathy for an invisible Global South workforce: It’s about re-envisioning the synergy between “hard labor” and cultural creativity, and the social questions that artists reflect and are called upon to resist. There’s no blueprint for activism, but rather an impulse to recapture and rebrand cultural capital from below, so all workers can wield culture as a tool for dismantling social hierarchy, and building anew. To that end, the new vanguard of creative laborers are constructing a new platform for protest as they go, and redefining the work of the artist, and the labor of creative protest, alongside workers of every stripe.